Clogged gutters and downspouts don't function properly and can eventually lead to expensive repairs from water damage to your home. The type of ladder work required to clean gutters can be dangerous. Our employees are licensed, fully-insured, trained and experienced. 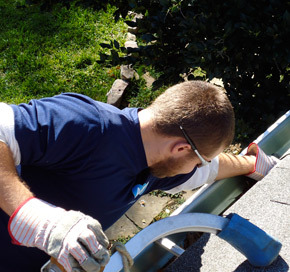 We clean the gutters and clear the downspouts. We remove leaves and branches from the roof and roof valleys. We don’t feel that the job is complete until the debris from the gutters that made it to your yard, walkways, and decks are collected and taken away. Pricing is based on the number of stories and if there is a “gutter-guard” system to contend with. As with any other service that we offer, we stand by our work and have a 100% satisfaction guarantee. To receive a free, no-obligation estimate contact us today.